Hello everyone! 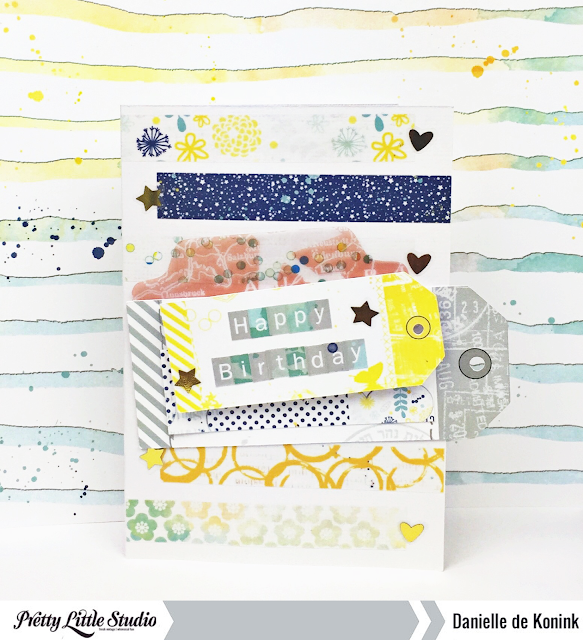 We're featuring vellum tape today over at Pretty Little Studio. I was so happy to see this new addition to the Let's Go collection, there are so many ways to use it and it gives a perfect touch to every project. For the card I'm sharing today I used the vellum strips to create the background. This is such a quick and easy way to create a design. At the end of each strip I added a gold star or heart. For the sentiment I used the Tiny ABC Cloudy Day and put them on a shipping tag, that I layered on another bigger shipping tag. I tucked in a clear tab shape behind the tags and the card is done!